AMHERST, VA � We�d all like to think we�ll get to know someone well enough to know his or her mind. It can come through months of correspondence, years of companionship, or decades of observation. But even then, there are always questions. What would they do in a certain situation? What would they think? What would they say? Luckily for us, Sam Snead Jr. (Jack), son of the late Sam Snead, took advantage of his years with his legendary father, learning his thoughts -- and Jack used that knowledge to help finish Poplar Grove Golf Club in Amherst, Virginia, about an hour south of Charlottesville in the central part of the state. The par four 12th hole. Quite a view, and a good golf hole, too. Snead knew his Dad�s mind, and his Dad�s wisdom still guides him, even today. The elder Snead actually took part in the design of Poplar Grove as well, though he grew ill before he was able to finalize the work that bears his signature (he made four visits to the property before he passed on). 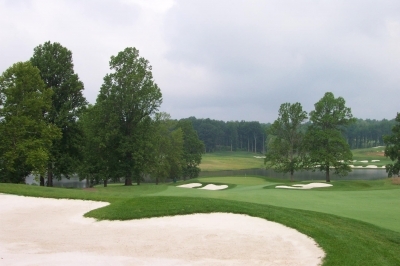 In his place, Jack Snead worked with Ed Carton (who tutored under Tom Fazio) to complete what is destined to be included amongst Virginia�s group of classic golf courses. That�s a pretty good club to be a member of, considering Poplar Grove opened just a few months ago (May, �04). The par five 6th hole was one of Sam Snead's favorites, where you can definitely go for the green in two if you can place the ball to the right side of the dogleg off the tee. The elder Snead would certainly know what�s foolish in the game of golf. Not only was he one of the greatest professional players of all time, he counted amongst his friends some of the best minds in golf course design, like Donald Ross and Robert Trent Jones. Ross and Jones were the ones doing the Snead brain-picking back then, because although they wanted to challenge the best golfers with their designs, they wanted to do so fairly. No one likes tricked up golf courses, and that�s a principle that�s weathered the tests of time. Jack Snead said Jones was always trying to get his Dad more involved in the design business, but he never had time with an ambitious Tour and appearance schedule. But that didn�t stop Sam from contributing his ideas to the profession, which is where the younger Snead continues the legacy. At 471-yards, the par four 10th hole is difficult in any situation, even if it's downhill. �Dad liked the greens to have enough roll in �em where you can obviously see the breaks � he hated flat greens. He liked bunkers where as much as possible, the ball�s not going to hang up there on the face. And he never liked grass bunkers � they�re a cheap way to penalize somebody, and they�re hard to hit anything out of,� Snead Jr. explained. There was one thing Snead was very passionate about, according to his son � providing a bailout for the high handicapper, so he won�t have a forced carry over water. Snead�s entire philosophy was centered on the second or approach shot, because that�s where the best players will show what they can do � the �scoring� shots. 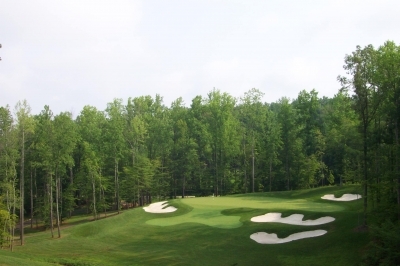 For that reason, Poplar Grove and all of Snead�s designs are pretty friendly off the tee, but demanding to get the ball close to the hole on the greens. 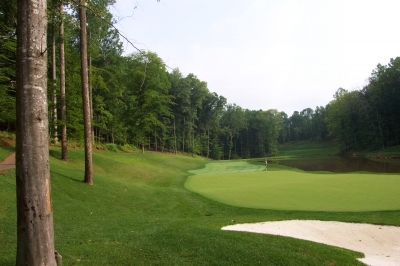 Finally, Snead had a design philosophy that you�ll definitely see at Poplar Grove � reachable par fives, and a drivable par four. �Dad always liked making the greens open as much as possible on par fives so that if a guy hits his best second-shot ever, he can roll it up on the green. And he also liked at least one short par four, like the third hole on Pinehurst #2 (which was Snead�s favorite course), where you can possibly hit the green from the tee � but if you miss, you might have a hard time making par,� Snead Jr. added. Needless to say, Poplar Grove embodies all of both Sneads� philosophies. Director of Golf David Conforti says there's a ton of room off the tee of the par four 2nd hole, but you'd never know it from this view. Looks like a lot of water. Helping with the details of construction and the �nuts and bolts� on how to build a golf course (as well as the design) was architect Ed Carton. Carton was originally hired to build the course with the older Snead, but ended up working with father and son � more so with Sam Sr. on the front nine, and Jack on the back nine. Carton said Snead would talk to anyone if they came up to him. I myself met Sam Sr. once, and I�d have to add my �ditto� to Carton�s experience � he was more than happy to say �glad to meet you� and even posed for a picture with a member of our party. It turns out there was much to work with at Poplar Grove. 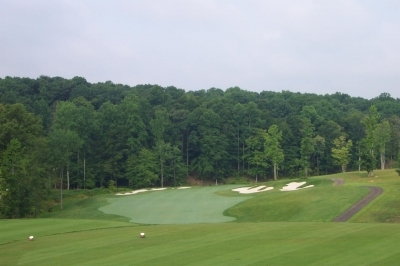 �It was a tremendous piece of property, and the owners really gave us the freedom to design the golf course, so we were able to really take advantage of the tremendous natural beauty at Poplar Grove. The goal all along was to impart a lot of Sam Snead�s wants and likes onto the golf course, and I think we accomplished that very well,� Carton added. From the tee on the par four 15th hole -- plenty of room to drive the ball, but there's a creek down the right side... I know from experience. Echoing Jack Snead�s earlier comments, Carton said Sam wanted the course to be very friendly to the high handicapper, especially off the tee � so they built five sets of tees (ranging from 4980 to 7059 yards) to do just that. He also wanted open approaches to the greens to encourage the ground approach. Snead said the modern game had evolved into too much of an �air� competition, so at Poplar Grove they sought to reward creative bump-and-run shots as well. In addition, most of the tees are elevated, so the course plays some shorter than its listed yardage. There are only three uphill tee shots, and one of those is a drivable par four and another is a reasonably short par five, at 524 yards from the back tees. Further, the fairways are shaped to provide extra roll. Again, very friendly from the tee. 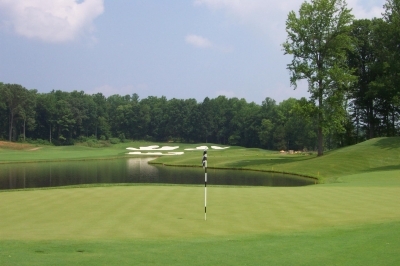 As if the golf course wasn�t enough, Poplar Grove brings the �Troon Golf� experience to Virginia. Perhaps best known for its properties in the west, now we�ve got Troon management and service right here in the Old Dominion. You'd think a slightly downhill, 184-yard hole would be easy, but the par three 7th hole's green will still make it challenging. There�s a relief right there. Too many times these days, clubs make the mistake of over-bearing service. I personally prefer to clean my own clubs � and it�s not a matter of forking over a few bucks to the cart attendant to avoid the trouble. Sometimes you want the service, sometimes you don�t. The fact they recognize it at Poplar Grove is quite refreshing. They very well could rest on the golf course�s laurels, if they so desired. 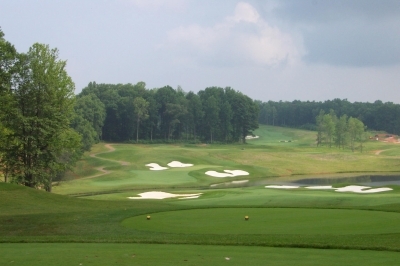 One of the most stunning visual courses around, Poplar Grove�s front nine weaves in and out of stands of hardwoods with a few shots over lakes and streams � uphill shots, downhill shots, varied terrain. The back nine moves out towards and around the large lake that dominates the property, with more interesting ups and downs. It reminded me a bit of Kinloch Golf Club, Poplar�s ultra-everything cousin to the east, near Richmond. Poplar Grove, being so new, doesn�t quite match up in the conditioning sense, but the visual presentation is fairly similar. 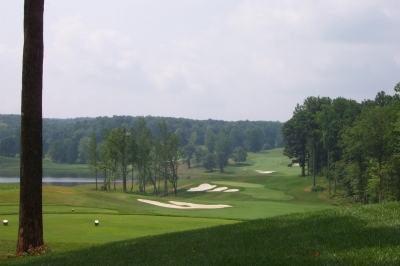 One thing�s different � you have to be a member (or a guest) to play Kinloch, and at least for now and the near future, you can play Poplar Grove seven days a week. At 238-yards from the back tees, the par three 17th is one of the longest one-shotters in Virginia. With water all down the right side, slicers beware. There�s another difference, being Poplar Grove is part of a housing development � but the houses are on large lots (one to five acres, and there are only 104 lots on 500 acres in phase one), well set back from the actual playing areas. The golf course won�t be alone in the woods, but it�s the next best thing. And there�s even history at Poplar Grove. The plantation�s manor house was built in 1773, and it�s currently serving as a temporary clubhouse and restaurant. The golf shop is located in a historic log cabin, though Conforti says they�re not entirely sure how old it is (but they�re pretty sure it pre-dates the manor house). Eventually, there will be an Inn, Tavern and Conference Center on property, with the goal of making the golf course mostly private, serving members and Inn guests � though it will probably never be completely private. With this kind of quality, this level of service and the Troon folks� enthusiastic attitude, Poplar Grove can�t help but succeed. Its location is a bit of a challenge to reach from major populated areas, but that won�t stop a flood of return play for those who taste it once and want to go back. Then you might say, they can appropriately change the club�s name to Pop-u-lar Grove, and they�d deserve it. The par three 4th hole will always have its own little private corner of the property, and it's a pretty one at that. For those unfamiliar with this part of Virginia, you�re truly missing out. 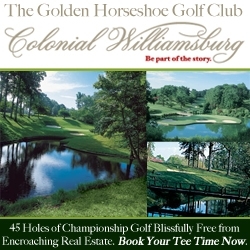 Central Virginia�s rolling hills and majestic hardwood forests are about as beautiful and scenic as you�ll find anywhere. It�s much more than just Jefferson�s Monticello, though you certainly can build a vacation around the 3rd President�s lifetime work � even a golf vacation. We chose to stay at the Boar�s Head Inn in Charlottesville. Owned and operated by the University of Virginia, this is far from what you�d call a college dormitory. The �Boar�s Head� part originates from Shakespeare�s era in England, when the boar�s head symbolized good food and hospitality. 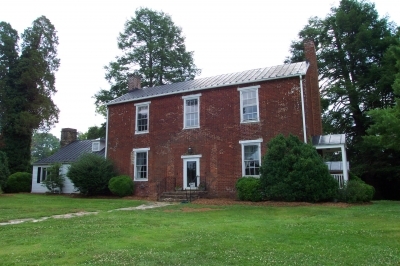 Built in 1773, Poplar Grove's Manor House still figures prominently in the property's present and future. That�s precisely what you�ll get at the Boar�s Head Inn, along with some attractively manicured grounds, spacious guest rooms (most with patios or balconies), and conveniently located next door to Birdwood Golf Course, the University�s golf layout, designed by Lindsay Ervin. The Boar�s Head Inn � the name�s a bit deceiving � offers a full range of resort amenities, a lot more than you�d expect from �just� an Inn. There�s a Spa with treatment rooms, a Sports Club with tennis and fitness equipment and even activities such as Hot Air Ballooning during certain times of year. Don�t forget to eat � as if you would. Simply put, the Boar�s Head Inn�s dining experience is as fine as we�ve seen this season, both in service and cuisine. We chose dinner at the Old Mill Room, where the dress is casually elegant, and so is the atmosphere. Rated four-diamonds, the fare in the Old Mill Room is worthy of an Inn with a reputation for good food and hospitality. And don�t get me started on the wine list � you�ll need a separate sitting just to read it. The Boar�s Head Inn is quite busy during the UVA school year, but spacious enough to accommodate visitors from just about anywhere. Needless to say, it�s highly recommended, and we�re looking forward to going back. 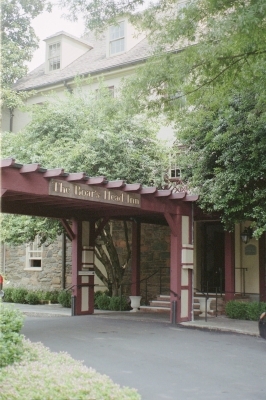 The Boar's Head Inn in Charlottesville. A great place to stay, and accessible to Poplar Grove. Check the website: www.boarsheadinn.com for further information, or call (800) 476-1988, or local (434) 296-2181. Tees/Yardage � Slope and Rating were unavailable at press time. Fri-Sun, $69. After 3 it�s $52. M-Th, $49. After three it�s $37. All rates include your cart and range privileges.